In 1635, the major proportion of the Nefyn population of 60 men were employed as fishermen, and in 1771 the value of the annual catch at Nefyn was £4,000. 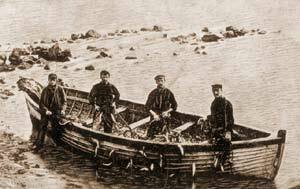 By the end of the nineteenth century, herring fishing was of great importance and by 1910 it was estimated that were about 40 boats, each manned by a crew of three or four. In a four-manned boat, the 18 foot craft was rowed by three men with a pair of oars each, while the other usually the owner of the boat, was responsible for the steerage. Each crewmember had two or three nets. Although many of the fishermen from Nefyn sailed as far as the Irish coast in search of herrings, the coast of Llyn from Nefyn to Bardsey Island, was the richest herring catching area, and the people at the time regarded these herring much tastier than the once from the south coast of Llyn and Cardigan Bay. Nefyn beach was very safe as well, with gently sloping sand, had a narrow tidal range and the boats could be launched from the beach at almost any state of the tide. Double ended boats that were easy to launch from beaches were preferred, although sails were widely used for herring fishing as well. When Lewis Morris visited Nefyn prior to him publishing his book in 1748, he found a thriving trade and a useful pier for the herring fishery that had been built by Contributions, chiefly by the generosity of William Bodvill MP. The previous year, 1747, he found that nearly 5000 barrels of salt herring were exported, besides that needed for local consumption. Nefyn herring became renowned throughout Wales, and the port became the principal herring port of the north. In 1679, Nefyn supplied the nearby Glynllifon Estate with herrings which according to Estate books, cost between a shilling and 14d a hundred. 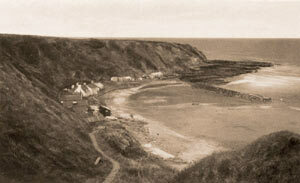 The cry ‘Penwaig Nefyn’ became common throughout Llyn and indeed far beyond. Einion ap Addah 9 oxen 6 cows 3 heifers 20 sheep 3 nets. Ieuan ap Madoc 4 oxen 1 cow 1 heifer 1 horse 1 boat 4 nets. Llywarth Crun 1 cow 1 net. Bleddyn Fychan 6 oxen 3 cows 1 heifer 1 horse 1 small boat 3 nets. Tagwynstyl wraig Addaf 2 cows 1 heifer 1 horse 1 net. Dai Bach 1 heifer 2 sheep 2 nets. 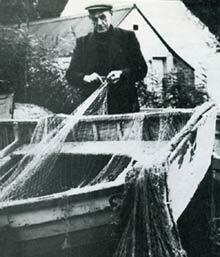 The type of herring net used at Nefyn was a fine meshed net. Herring nets were usually about 50 yards long and depth varied from 6 ft to 10 ft. Stone weights were placed at the bottom of the net, and the bottom rope in the traditional net being of grass. Stones, each cut about four inches long were picked, and a channel for attaching the nets was cut round each stone. The stone weights were attached to the net by means of thin string that would break very easily in a stormy sea. At least in these conditions an expensive net could be saved. Weights were attached every two yards on the bottom, while corks floats were attached to the upper, again with approx 2 yards between each float. Each net was also equipped with one or two anchors of one and a quarter inch iron, made by local blacksmiths. Nets were set in two ways, depending on where fishing took place. In Nefyn Bay both ends of the net were anchored, while off Nefyn Point only one end of the net was anchored, the other end was buoyed and allowed to move with the tide. 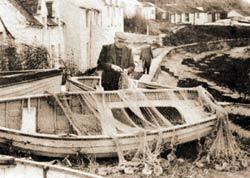 Not all those who fished could afford a net, and some men at Nefyn acted as net merchants. They loaned nets to fishermen and as payment they kept a quarter of all the catches that fisherman obtained with that net, for the duration of the loan. To fish the anchor was first thrown out, the boat was allowed to drift with a length of the rope attached to the net, the net was then paid out and a second net and possibly a third were attached to that, to provide a long wall of netting. The other end of the net was either anchored or allowed to swing, and a leather buoy about two feet in diameter being attached to the net for floating and as a marker. After about six or seven hours the net could be inspected to see whether anything had been caught. If a catch was made, the net was pulled into the boat, the catch removed, and the nets again reset. Nets could remain in place for five or six days, and they were inspected daily before dawn. When there was a new moon it was believed that the herrings came close in shore, with a full moon, the herrings were much further out. The Oath of a Packer of Fish Nefyn, Corporation Book, 1815. You shall well and truly swear to execute the office of Packer of Fish within the Porth of Porthdinllaen, in which you shall see that White and Red Herrings shall be packed in lawful Barrels and Vessels and shall be truly and justly laid and packed and shall be of one saying or drying and equally well packed in every part of the Barrel or Vessel, and you shall also see that everything belonging to the said Office of a Packer be well and truly executed within the Port aforesaid, according to the best of your skill and knowledge. Fishermen learned to watch for the sign of the herring. They watched for the natural predators of the fish; porpoises or diving gannets and other signs such as oily patches in the water or phosphorescence below the surface. Basking shark, which feed on the same plankton as herring, were another sure sign that the herring were in the vicinity. All in all, they had to draw on a vast wealth of knowledge only gained through experience to seek their prey. The proceeds of the catch were shared equally between the members of the crew, with one share being allocated to the boat. 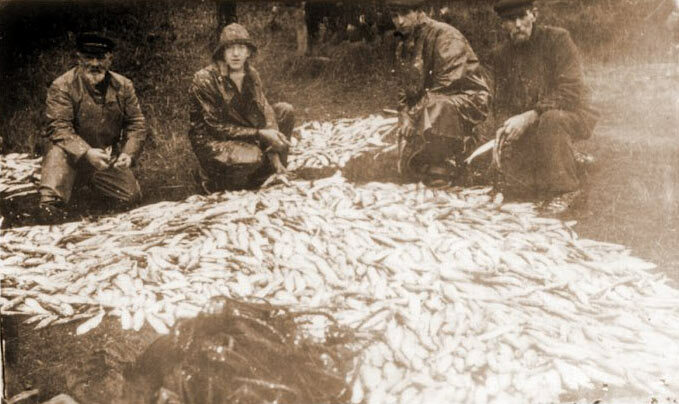 Quite often, the fish merchants did not pay until they themselves had disposed of the fish. If there was a glut of fish, more than the travelling merchants could cope with, Nefyn herrings could be sold to a Pwllheli merchant, who often paid a very low price for the fish. 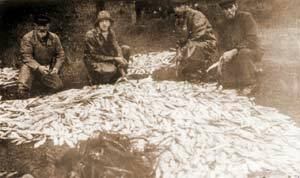 In November of 1697, 200 herring and one cod fish was bought by the Cefn Amlwch Estate for 15p but only two months later in January 1698, 500 salted herring were only 1 shilling. Irish boats would also buy the herring off them, when they were at the fishing grounds, saving them a lot of bother, and leaving them with room in their boats to catch more. Some of these Irish boats were quite large, and these would salt the herring on their way home, ready for the markets of Dublin and other Irish towns and cities. Each fishing village on Llyn had its own fishing limits and it was an unwritten law that no fisherman from a particular village could trespass upon the fishing grounds of another. September was the right time to begin. Others believed that no one should venture out until after Thanksgiving Day, about the third week in October. Herring fishing continued until late January. Some years were better than others, there was a glut in 1710, 1711, 1714, and 1730, and 1771 and 1822 were particularly good years. But when the herring didn’t show, and this happened quite often, as in 1805 ~ 1808 and many other times, life became very hard for the 300 odd people that were employed in the industry at these times. And we must not forget that herring was a vital part of peoples diet, so the lean years must have brought hungers as well as hardship. 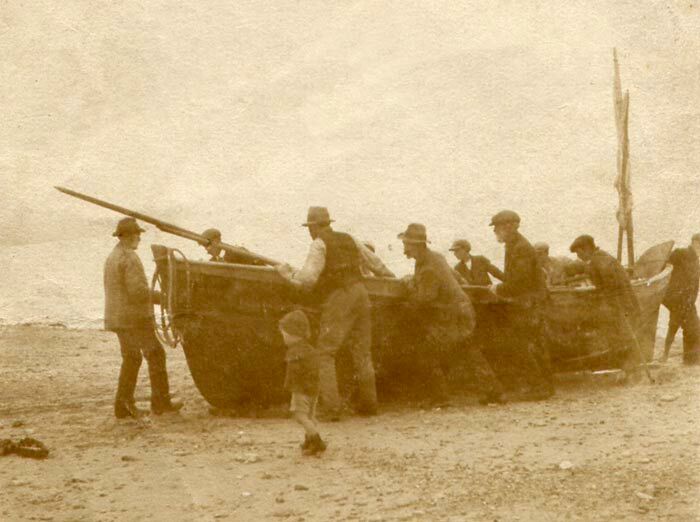 Although Nefyn always had some full time fishermen who fished mackerel, crab and lobster, most of the fishermen were part timers. 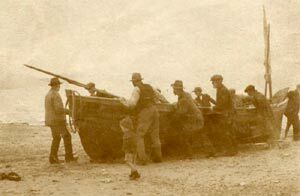 Some were quarrymen, others were merchant seamen. Some even came from other fishing villages on Llyn to take part in the Nefyn herring season; for example, Aberdaron fishermen used to lodged at Porthdinllaen for the whole season. And in the Cefn Amlwch Estate books of the 18th century, it was noted; "There is great concern, many of the farm labourers have gone fishing, and ignoring the land". After 1918 herring fishing was completely wiped out at Nefyn because of the war and also a decline in herring, and fishing from the port never recovered. There are barely any reminders today that this was once the ‘Herring Capital of Wales’.